Born into the back streets of a small Canadian town, Rose battled incessantly with her practical and shrewd stepmother, Flo, who cowed her with tales of her own past and warnings of the dangerous world outside. But Rose was ambitious - she won a scholarship and left for Toronto where she married Patrick. She was his Beggar Maid, 'meek and voluptuous, with her shy white feet', and he was her knight, content to sit and adore her. 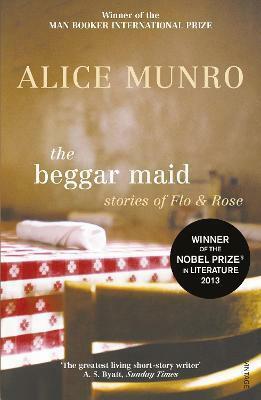 Alice Munro's wonderful collection of stories reads like a novel following Rose's life as she moves away from her impoverished roots and forges her own path in the world. In this series of interweaving stories, Munro recreates the evolving bond between two women in the course of almost forty years. One is Flo, practical, suspicious of other people's airs, at times dismayingly vulgar. the other is Rose, Flo's stepdaughter, a clumsy, shy girl who somehow leaves the small town she grew up in to achieve her own equivocal success in the larger world. In this exhilarating series of interweaving stories, Alice Munro re-creates the evolving bond--one that is both constricting and empowering--between two women in the course of almost forty years. "Alice Munro captures a kaleidoscope of lights and depths-she manages to reproduce the vibrant practice of life while scrutinizing the workings of her own narrative art-an exhilarating collection"